A good water bottle can last you a long time. Unfortunately, there are many low-quality bottles being sold today. Many leak, dent, break or just have harmful chemicals that you don’t want to be drinking. Through careful research, we’ve put together a list of the best water bottles made in the USA, so you can find a quality companion to have with you wherever you go. During our research, we found five brands that are made in the USA and really stood out from the competition. Brands like Nalgene and Polar Bottleworks offer lifetime warranties and top-quality bottles that are built to last. We also like Rolling Sands for offering a high quality solution that’s offered at affordable bulk pricing, and we really enjoyed the top performing metal bottle offered by Liberty Bottleworks. We tested each of these bottles out carefully to ensure that they offer reliable performance and put together a list of options based on their form, and their best-case use. Below are deeper details about each of our top picks, along with what we liked and didn’t like about each one. 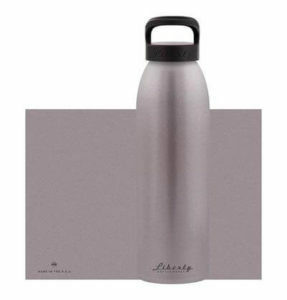 Liberty Bottleworks is an American company dedicated to producing sustainable water bottles and offers solid performing products like their Straight Up Aluminum bottle. This water bottle is made almost entirely from aluminum and offers a 24 oz. capacity. We love the solid feel of this bottle and that it’s made almost entirely from recycled materials. The water bottle is easy to open while forming a water-tight seal thanks to its carefully designed lid. It has a basic plain aluminum finish that’s a shiny silver color, and it’s thick enough to withstand heavy use over time. We were excited to find that one of America’s most iconic water bottles is made in the USA: the 32 oz. Wide Mouth from Nalgene. This water bottle has been around for decades, and still offers reliable performance that you can count on for a lifetime. We really enjoy the wide mouth design and the massive 32 oz. carry capacity that can help you stay hydrated all day long. 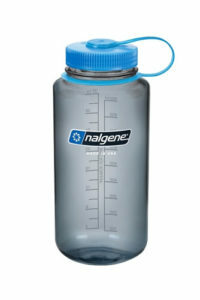 Nalgene products are free of all BPAs, BPS and phthalates. The water bottles feature a thick screw-on cap and they come with a lifetime guarantee that you can count on. As long as you use the water bottle with care, it should last you as long as you need it. We also spoke with the Nalgene team about why they choose to manufacture in the U.S.
Polar Insulated Bottles are a good investment for athletes and active people that want a convenient way to stay hydrated while on the move (these are great for bikes). These bottles feature a slim design that will fit into a bottle cage on a bike and most vehicle cup holders. They are made from BPA and Phthalate free plastic, and designed to make it squeezable for quick water access. This tough bottle features double insulated sides to keep water cool for longer, and it’s protected with a lifetime guarantee so you can count on it holding up for many years. We love the strength of these plastic bottles and that Polar Bottle stands behind its products. 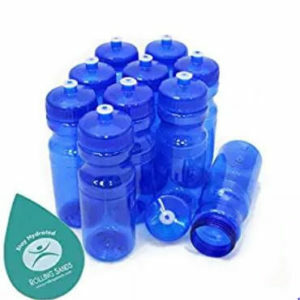 The company ships out free replacement lids to customers regularly, and has a strong focus on reducing plastic use by offering a top quality long-term bottle for drinking on the go. 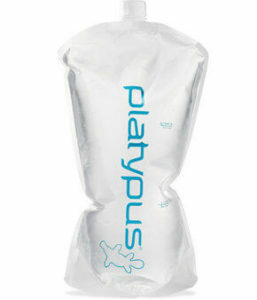 The Platy 2.0L Bottle from Platypus is a top-rated collapsible water bottle with a history of durability. This specific water bottle is free of all BPAs, BPS and phythalates. We love that water doesn’t have a plastic taste when you drink out of this pouch and the tough threaded cap design that this pouch uses. When empty, it’s nearly weightless, which makes this pouch ideal for backpacking. The Platy has a neutral design and will go well with most backpacking setups. 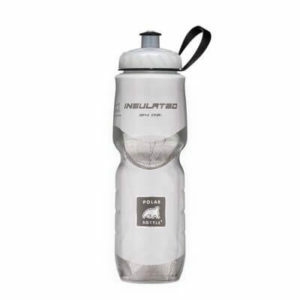 Its 2.0L capacity is enough to keep you hydrated for extended hikes, and this bottle can be paired with different Platypus threaded caps or drink tubes for versatility. It’s also usable with a variety of GravityWorks filters for lightweight filtration needs while camping. Rolling Sands offers a high quality set of water bottles that are ideal for bulk purchases because they’re affordable and leak free. These tough BPA free water bottles come in six different color finishes and come 10 to a pack. The bottles have a squeezable design and deliver a stream of water without denting when squeezing them. Each of the bottles has a 24 oz. water capacity and they are a good pickup for your son or daughter’s sports team. The bottles must be hand washed and can change shape when placed in a dish washer – the one major downside that we experienced when testing them. All of our top recommendations are BPA free and most are also free from Phthalates as well. This is important for healthy use, because BPAs have been linked to heart disease and a number of other cardiovascular issues. Phthalates are a large group of chemicals, but have been linked to a huge range of disorders including Diabetes, asthma, autism, breast cancer, low IQ, and many others. Quality water bottles need to hold up through long-term use. We look for durable metal construction or thick walled plastic that can withstand drops and other accidents. Most of our top-rated bottles come with long-term guarantees and some of the water bottles on our list have a lifetime guarantee. During testing we verify that water bottles are leak free. Screw lid bottles should have thick threads and seal tight. Snap top caps should have wide caps and a firm fitting location. During testing, bottles are placed on their sides and turned upside down to verify they are leak free. Some plastic water bottles are known for having a strong taste when using them for drinking water. Our bottle options don’t change the taste of the water you’re drinking, leaving you with that cool, crisp taste you’re expecting. Many of our selected bottles focus on a usable form-factor that makes them convenient to use. This means that most are narrow enough to fit into cup holders in vehicles and water bottle racks for bikes. Always think about how you’ll use a water bottle and then choose a size that will fit your use case best. We want to make sure you’re getting the best water bottle for your money – after all, we’re consumers too! We eliminated any brands from our consideration where we felt like the quality did not live up to the price.